Simple file verification (SFV) is a file format for storing CRC32 checksums of files in order to verify the integrity of files. SFV can be used to detect random corruptions in a file, but cannot be used for checking authenticity in any meaningful way. Typically, the .sfv extension is used on SFV files. 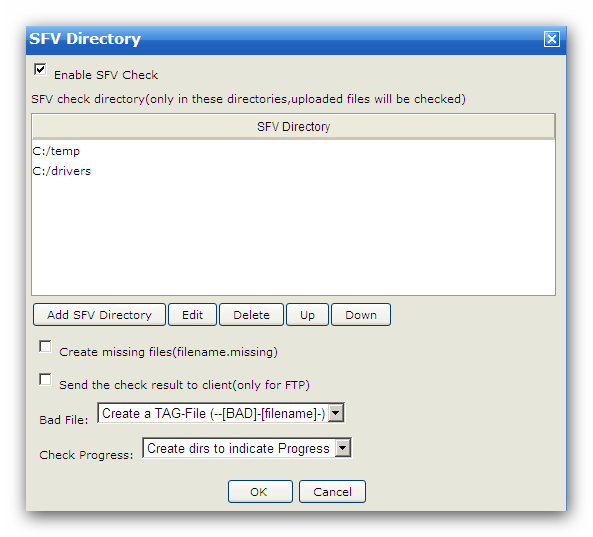 SFV Check is used to check the files user uploaded. If you enable this option, when a client upload an SFV file, the server will start to check the files listed in the SFV file and send the result to client. Client can create SFV files by QuickSFV. The server only checks SFV files in the SFV Directory. So if you want to enable SFV Check, you need to add SFV directory first. If the files listed in the SFV file can not be found in the same directory with the SFV file, missing files(filename.missing) will be created. FTP clients can receive the checker's response message. What to do when the server encounter a bad file. You can choose "Create a Tag File", "Rename the bad file" or "Delete the bad file". How to indicate the check progress. You can choose "Create dirs to indicate progress", "Create files to indicate progress" or "Do not indicate progress".